I’ve been using this BB cream just about every day this month. I love how light it is while still providing great coverage. Is definitely perfect for summer! I’ll be doing a comparison post of the two different formulas of this BB cream very soon, so keep an eye open! I FINALLY got my hands on this blush, and it’s been my default blush all month. it’s a beautiful glowy coral that goes perfectly with just about everything! This blush is an amazing drugstore buy: it’s so smooth and easy to apply, and it stays on all day. Also, it’s kind of like a combination blush and highlight, so I don’t need to use both. I started using this little sample when I got back to the humid Pittsburgh weather. It’s been perfect on its own as well as underneath my other mascaras as reinforcement against this hot weather. It keeps my lashes looking long and curled all day! I started reaching for this handy liquid liner pen on mornings when I was in a rush, and then practically every morning. The super fine tip makes it easy to get the right shape for a winged look. This marker is really pigmented and lasts all day, even in the humid weather I’m experiencing now! I’ve been using these two products together all month when I’ve wanted a wearable red lip that lasts all day. I put the balm stain on before doing the rest of my makeup to let it set, and then layered the lip butter on top on my way out or just throughout the day when I needed a little refresher. For those of you who follow me on Instagram, you’ve probably seen that I got a pair of matte black Tieks from my boyfriend for our two-year anniversary. 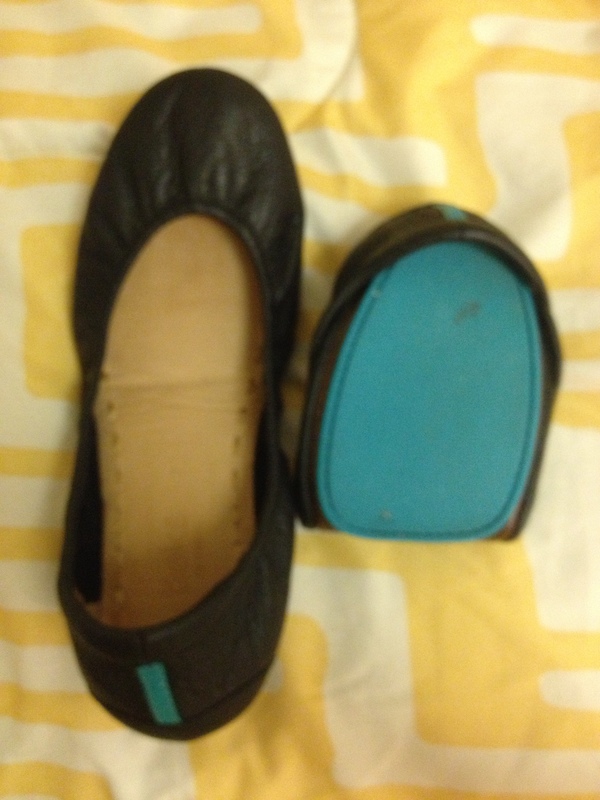 Tieks are super durable, foldable ballet flats. I’ve been eyeing these for a while, and matte black is the perfect staple to start out with! They’re made of a soft black leather and go with everything (and they do have vegan pairs if that’s more your style). The one issue with these is that the back needed to be stretched out a bit, which I didn’t think about. I wore them for a full day right after I got them and got awful blisters on the backs of my ankles, which wasn’t fun, so I’ve been wearing band-aids or thin no-show socks to get by until the blisters heal and the leather stretches a bit. That’s it for my favorites this month! I can’t wait to see what all of you have been loving recently. And as always, thanks for reading and commenting! I love to talk to you guys.